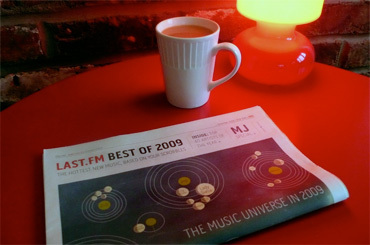 We work hard at Last.fm to give you and millions of users the services you have learned to love and to come up with new ideas. To keep the spirit high it’s sometimes helpful to break out of the zone for a moment, get some distance between you and the problem you try to crack, have a short break and then come back to your desk with fresh ideas. 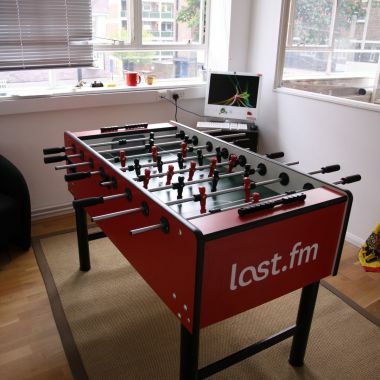 Many of us at Last.fm like to enjoy a game of table football to fill those moments. Now our football table has seen better times. The pitch is anything but level, and the last time we moved it to a new place we almost broke it. Twice. So it was time for something different. 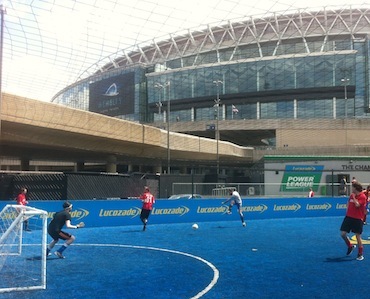 Back in April three of us (DavW, marekventur and I) took part in the London Realtime hack day. We managed to impress the jury with YouChoose, a collaborative YouTube playlisting web site. We won a prize and walked away with a brand new iPad… between the three of us. Rather than complain we sold the iPad to another member of staff and decided to put it towards a new football table. I added my half of the Spotify award of last year’s London Music Hackday to the stock, but it still wasn’t quite enough for a good table. It would be a shamelessly hubristic act to believe that we would keep winning prizes, but we gave it a try. 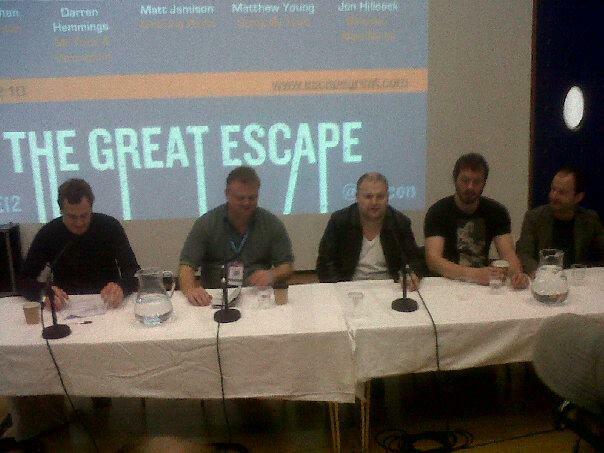 Two weeks after London Realtime we went to the Buckinghamshire countryside and took part at Game Hack. 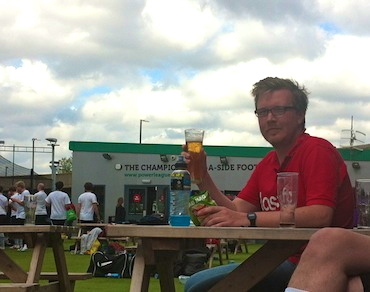 The three of us were joined by tdhooper. Within 24 hours of hacking and very little sleep, we created a little browser game and we won the prize for the best HTML5 browser game, awarded by Mozilla and Turbulenz. That gave us a good budget for a shiny new table, funded solely with money we won at hackdays. And now it is here. 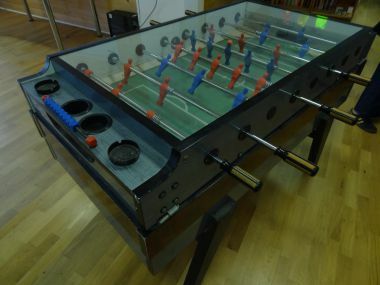 We ordered it from Kicker Klaus, a German mail order shop that specialises in all things table football. 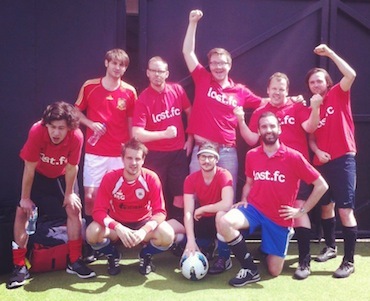 The Vector III weighs 125kg and we got it in Last.fm red, with red and black players, just as you would expect. I would like to tell you more about it, but I have been challenged to a game, and then it’s back to work: the database doesn’t code itself. About 6 weeks ago I started a short internship at Last.fm. 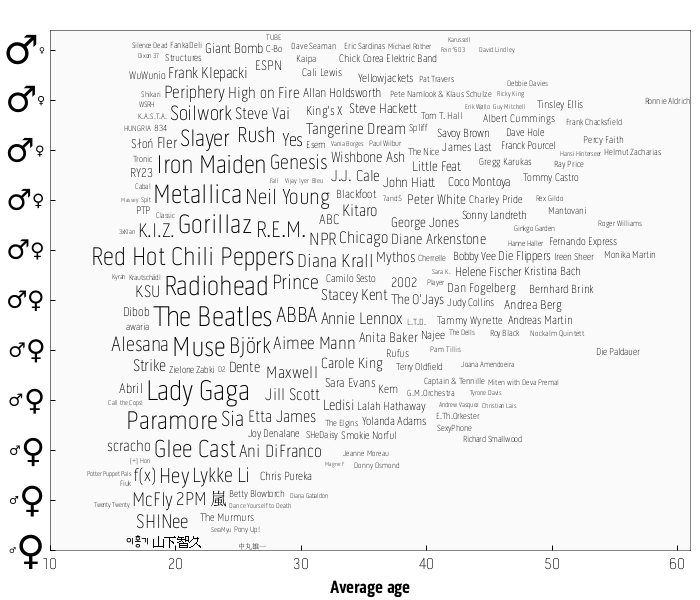 For my project I wanted to explore Last.fm’s data to learn how listening preferences vary with the listener’s age and gender. Apart from the science, the most important thing I found is that you can make awesome plots with this information. 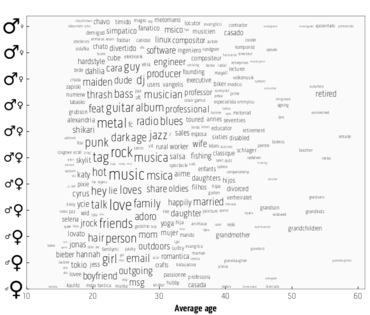 The sizes of the artists’ names indicate how popular they are, while their position shows the gender mix and average age of their listeners. 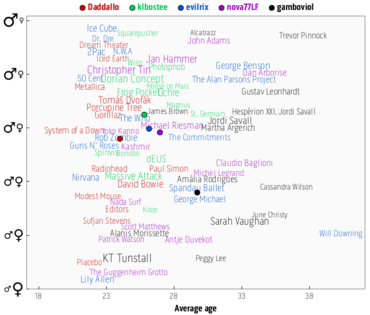 Based on the positions of the larger names, it’s already obvious which age category is most common amongst Last.fm users. 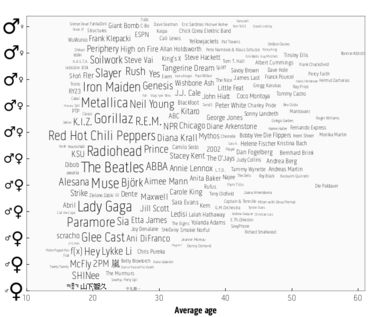 So, you can now use this plot to decide which music you might want to listen to. For example, if you are a healthy young male in your early twenties, you probably should listen to bands such as Iron Maiden and Metallica. Gorillaz and Radiohead might just be acceptable. If you get older you can then switch to artists like Neil Young and Genesis. It’s all quite obvious really. You can use it in the same way as the previous plot. 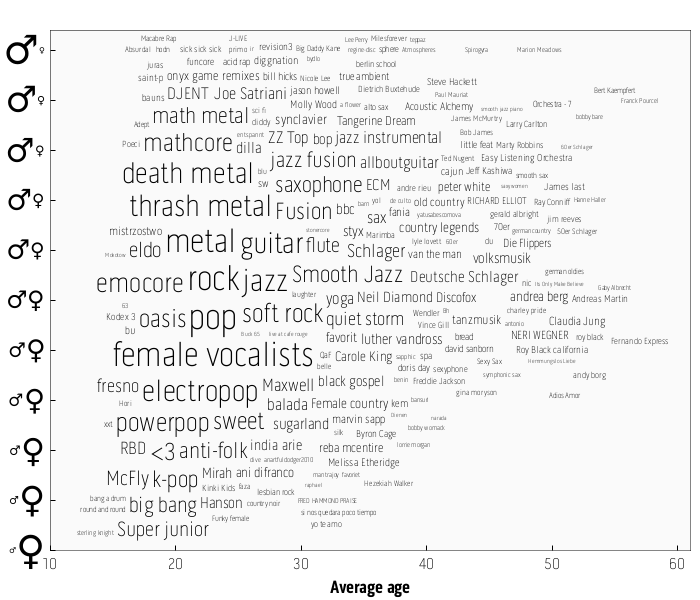 Apparently females like using band names as tags (Super junior, McFly), while males prefer finding lots of ways to say the same thing (metal, jazz). 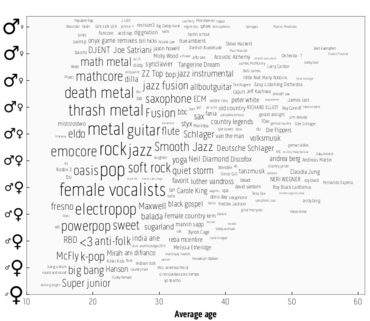 Most importantly we have just used science to prove that men don’t listen to much k-pop. There are actually so many fun facts about this plot that it’s just best to check it out yourself. The most obvious one is which hobbies you “should” have depending on your gender. Or you can find out at what age you should retire. We’ve even thought of those of you who like to print their visualisations as a poster by providing a bigger PDF version that has more artist names on it. Hopefully you’ll enjoy this demo as much as we did. In any case, we’d love you all to let us know what you think. A bit less than a year ago we launched the VIP zone on our Playground, with the promise that we would keep adding fancy visualizations to it as a special treat for our loyal subscribers. We already delivered on this promise with the personalised Listening Trends and Music Universe visualisations, and today we’re delivering some more. In this case we’re looking at Norman‘s listening behaviour for the past 90 days. Red and green represent weekdays and weekends, respectively, and the longer the hand the more the listening was focused around the time to which it points. Generally speaking, Norman seems to listen to music at later times of the day in weekends than on weekdays, and his listening seems to be less restricted to certain hours in the weekend. It’s also quite clear that he tends to listen to music from 10AM to 7PM on weekdays, which isn’t that much of a surprise since those are our working hours here at Last.fm. 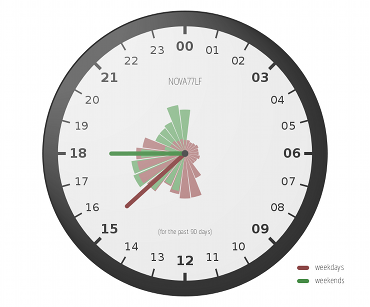 He accidentally left his radio playing overnight a few times though, as indicated by the smaller red bars from 8PM until 9AM. Since we use this account for the reception radio in our offices — which plays pretty much 24/7 — the listening is spread out across all times of the day, leading to two hands that are extremely tiny and cute. 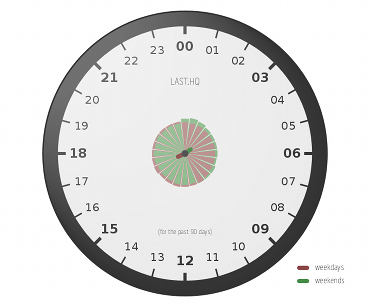 We very much hope you’ll enjoy playing around with this new visualisation, and that some of you will point to particularly interesting listening clocks or discuss potential improvements in our Playground forums. Meanwhile, we’ll start working on the next one! We’re thrilled to announce that the Last.fm Playground now has a brand new VIP zone. In this subscriber-only area we’ll showcase some of our fanciest ideas, visualizations, or plain weird projects as a treat to our loyal subscribers! Here’s an overview of the new stuff we’re releasing today. 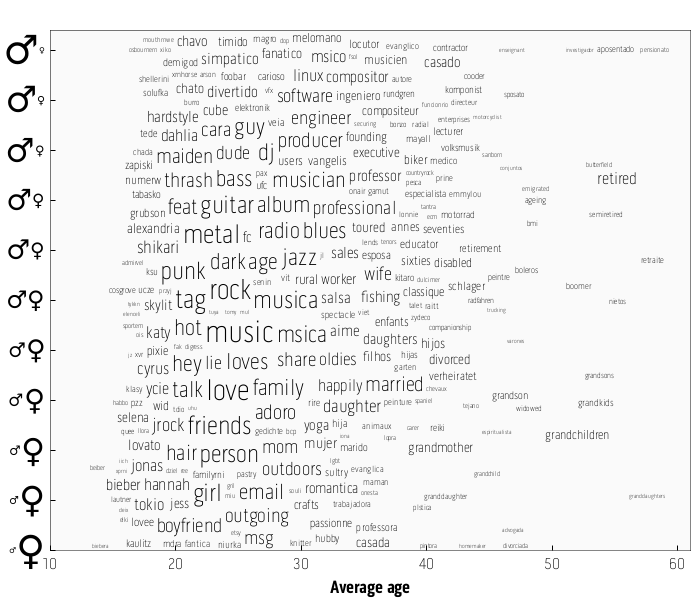 Each line is a tag, moving north or south depending on how much you listened to music described by this tag. 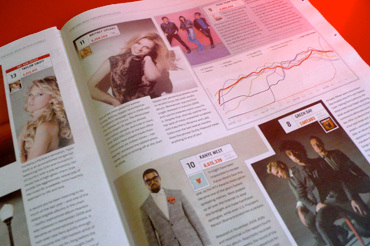 Your most popular artists for each tag are also shown. Of course, the longer you’ve been scrobbling, the better it looks! I’m really proud that I’ve been scrobbling so regularly over the past years — and that I’ve left this trail of data that allows me to revisit today, through music, past moments of my life. 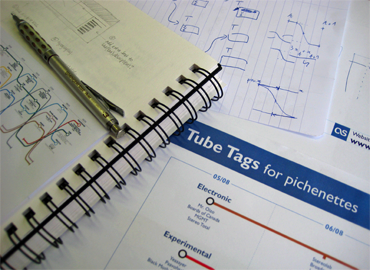 While only subscribers can currently generate a Tube Tags map from their listening history, the map is visible to anybody — we thought you might want to share it with your friends. If you prefer printing this as a poster, we recommend Diginate’s online poster printing. The new VIP zone also contains a few other toys: Image Chart creates a collage of your top artists’ images, History Chart summarizes your listening activity for your top artists in a neat visualization, and Artist Connections is a musical equivalent to the Six Degrees of Kevin Bacon game; try it out to check if there’s a chain of similar artists linking Paris Hilton to Metallica. Finally, we also added a new World Chart demonstration that shows you in which countries a given artist has been listened to most often. We’d love to hear more from you about these features – please send us feedback or join the Playground Group to discuss them with others. One night at the pub we discussed whether one could replace Hadoop (a massive and comprehensive implementation of Mapreduce) with a single bash script, an awk command, sort, and a sprinkling of netcat. This turned into a weekend project dubbed bashreduce. I think it’s a neat idea! If you think it’s a neat idea, and you look at this gnarly bash code and think of ways to improve it, to make it more useful or more elegant, you would enjoy working for us. We’re looking for a clever C++ developer to help us tackle data mining and scale problems. My favorite line in the job posting is Interested in – we do all those things save one, which you can probably guess. We’ve collected a few of our developer’s blogs here as well – more fodder for those of you interested in what we do. There are plenty of great groups on Last.fm. However, some of them can be a bit hard to find. We thought one way to make it easier to find groups would be to make it easier to find similar groups. What do you think? Btw, what are your favourite groups? Last.fm groups are a great way to find people that share common interests not necessarily related to music, such as ear-chopped-off painter fans, car enthusiasts, and people that clearly like meticulous descriptions of their behaviour. Group aficionados have probably already noticed that it’s possible to listen to group radio, but unfortunately this has sometimes been a disappointing experience. The reason is simple: the playlist was generated by averaging the tastes of the group members, and this can result in predictable charts. We have recently been experimenting with ways to emphasize what makes groups unique. By considering the average listener’s behaviour, we can show that members of the Saxophonists group listen to far more Sonny Rollins than others. Even though they listen to The Beatles a lot, it’s less special, because everyone listens to them a lot! So, next time you tune into group radio, expect a much better experience! People with no social lives, etc..